A tradition, that began in 1924 with the establishment of the MTR Restaurant by the Maiya family in Bangalore, India. Over the year MTR Foods has consolidated its market leadership in the South and is in the process of establishing a strong footprint across India, with successful forays into the northern, western and eastern regions. MTR also exports to over 30 countries across the world and of late has seen tremendous growth coming from its International business. In 2007 MTR Foods was acquired 100% by Nordic conglomerate Orkla. Since the acquisition Orkla has invested significant resources in upgrading the operations of MTR foods across every business function resulting in a strong business performance year on year. The Orkla global conglomerate comprises four business units: Orkla Foods Nordic, Orkla Brands Nordic, Orkla Food Ingredients and Orkla Brands International. While the Nordic region is Orkla Brands' domestic market, it has established strong market positions in India, Russia and parts of Central and Eastern Europe. MTR brings quality and originality to help create authentic and delicious Indian food from breakfast to dinner time. Ostindo is proud to be the Sole Australian Agent for MTR. Taste the combined benefits of convenience, health and variety with MTR Foods 'Ready to Eat' range. Our range of products cover wide range of delicious North Indian and South Indian recipes, to give a taste of food which taste just like fresh home cooked food. 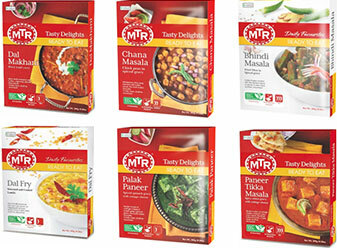 MTR range of breakfast mixes is 100% vegetarian and provides consistent results every time you use them. All you need to do is follow the step by step instructions on the pack to recreate the best loved and traditional favourites of Indian breakfast. MTR Food Meal Mixes are a delightful way to make your family meal -times that much more delicious! Follow our simple step- by- step instructions on the pack to recreate the classic cuisines of India! A rich concoction of almonds (badam), milk and sugar with saffron and cardamom flavouring! MTR Foods' Badam Drink is an age old classic Indian beverage. With all the goodness of almonds, it's rejuvenation in a can! MTR masalas use the purest ingredients which are 'Pounded to Perfection' to give you the right blend of Masalas which form an integral part of everyday cooking. Use the delicious MTR vermicelli to make savoury upma or toss it with boiled vegetables for a wholesome pulao or make creamy sweet kheer for the perfect dessert. MTR vermicelli made with a special process that ensures it is non-sticky and does not form lumps. 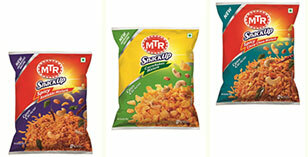 The MTR SnackUp range has a unique mix of interesting flavours, which will leave you craving for more! Pack in special stay fresh packs for lasting freshness and crispiness.